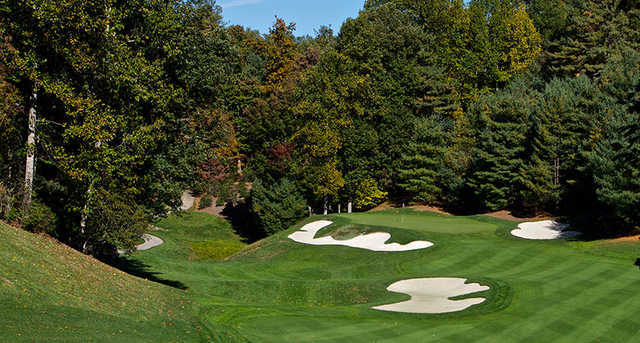 The 18-hole Champion Hills Golf Club in Hendersonville, North Carolina is a private golf course that opened in 1991. Designed by Andy Banfield and Tom Fazio, Champion Hills Golf Club measures 6719 yards from the longest tees and has a slope rating of 136 and a 71.3 USGA rating. The course features 4 sets of tees for different skill levels. 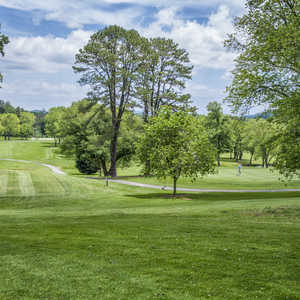 Champion Hills is an upscale residential community and home to Champion Hills Golf Club; a year-round facility nestled in the Blue Ridge Mountains of North Carolina. Both the community and the club are made up of residents and members that hail from more than 36 states across the US; people with an array of diverse interests, experiences, and passions, who have embraced the welcoming culture of Champion Hills. The majority of residents are year-round, affording them the opportunity to take advantage of everything Champion Hills has to offer. The golf course at Champion Hills is a Tom Fazio design which is nothing less than a collection of 18 signature holes, each one more breathtaking than the previous. After playing one hole and not thinking the view can get any better, you head to the next tee and have to start that thought process all over. Champion Hills is still considered to be Fazio’s home course and although he doesn’t live in the community anymore, you’ll still find him on the property from time to time with friends and business associates, enjoying one of his favorite creations. 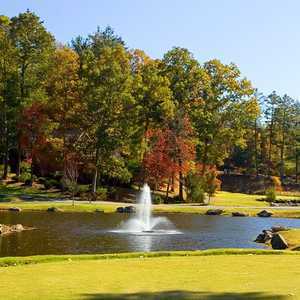 The golf course is ranked by Golf Digest Magazine among the top private courses in North Carolina and the #1 year-round course in Western North Carolina. In his own words Fazio said that Champion Hills was love at first site because of the magnitude and scale of the property and how truly unique it was. He realized that he could use the dramatic landscape around him to create a golf course that would be truly magnificent and admired by everyone who visited. Look around in any direction and take in all the beauty that God has created in the Blue Ridge Mountains of Western North Carolina. There’s a lot more flora and fauna out here than just all of the colorful flowers and shrubbery you see as you play your way around the course. Deer, turkey and white squirrels are prevalent and the occasional black bear has been spotted as well. Champion Hills offers players 5 sets of tees. 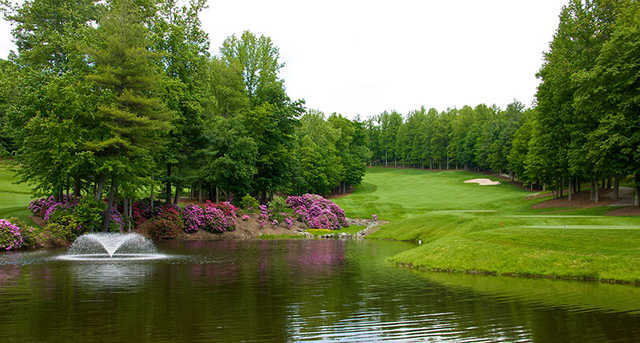 At only 6,527 yards from the back tees, it won’t be mistaken as one of the longest course in the area, but with a slope of 144, it is certainly going to test any golfer. The way the course is routed, 14 of 18 holes play downhill off the tee, although this doesn’t make it any easier. 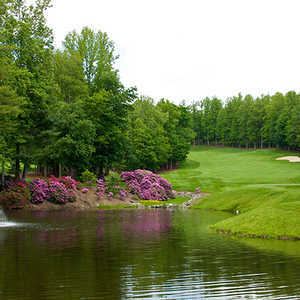 The Burgundy Tees (6,195 yards 70.4/140) and the White Tees (5,836 yards 68.9/132) also offer a fitting challenge. Just be sure to pick the set of tees that match your game if you want to maximize your enjoyment. With so many spectacular holes to choose from, it’s not easy to pick a single standout hole, but if I have to, I’m going to agree with the majority and give the nod to Number 9. It’s a par 3 and, although the scorecard says 196 yards from the back tees, it actually plays about 160. Regardless of what tees you’re playing from, you’ve got to drop a ball and give it a go from back here. At over 100 feet of elevation drop from tee to green, this hole is considered by many golf pundits to be one of North Carolina’s most spectacular holes. The green is large and protected by long bunkers on the right and back left. Miss it left of the green and you’re most likely in the trees. Chose the right club and you’re bound to do well. Of the remaining 17 holes, the par 5, 5th would have to be one of the favorites. It plays 543 yards from the Burgundy Tees and trees line both sides of the landing area, putting an emphasis on accuracy off the tee. The hole opens up a bit for your layup shot but the highlight of number 5 is the green. It’s long and narrow with water guarding the left side and slopes back to front. Getting on in regulation can be easier than the two-putt you face for par. Number 10 is a dogleg right par 4 that plays 385 yards from the White Tees. Your tee shot is downhill and anything well struck will leave slightly more than 100 yards downhill into another large multi-tiered green. The left side of the green sits considerably lower than the right; be sure to take enough club on your approach shot to cover the massive false front. Don’t let the length of Number 14 lull you into a false sense of security. This par 4 plays a mere 312 yards from the White Tees, yet the hazards that lie in front of you tell a different story. Step one is to play your tee shot downhill and avoid the fairway bunker on the right side. Complete this task and all that’s left is a short approach shot, uphill, over a large bunker in the middle of the fairway to a wide but shallow green with incredible undulation. Number 15 is another short but absolutely beautiful par 4. From the White Tees, the hole plays 306 yards with another downhill tee shot and uphill approach. If you have any control over the situation, play up the right side of the fairway off the tee, but beware of the large fairway bunker that awaits errant tee shots too far right. That beautiful stream that runs down the left side crosses the fairway just in front of the green and makes for an interesting approach shot. The green slopes back left to front right and the false front can make front pin placements somewhat tricky. Number 18 is yet another spectacular hole and the culmination of what has been an amazing four hours (give or take). Keep left as you make your way down the fairway, that will keep the stream on the right out of play. The hole plays 388 yards from the White Tees and the downhill tee shot should help you pick up a few yards. Most players will face a long to mid-iron approach shot uphill into a small green closely guarded on the right side by brush and bunkers on the left and in back. The green slopes gently from right to left. After your round, take a look around and take it all in; you’ve just played one of North Carolina’s finest courses. Step inside the clubhouse and you’ll find well appointed, airy rooms with terrific views of the mountains that surround Champion Hills. Within the clubhouse is a well-stocked pro shop with apparel from all of the industry’s top designers as well as the equipment from leading manufacturers. There’s also spacious men’s and women’s locker rooms. In the back corner is the Fazio Grille, where you will find your favorite post-golf libations; you can also grab a quick bite after your round. Many country clubs are judged by the dining they offer and if that’s your criteria, your search is over! The food in the dining room at Champion Hills is not only extraordinary, it’s anything but ordinary. Dishes such as Asparagus Di Parma, an appetizer that combines asparagus, prosciutto, parmesan cheese and a soft poached egg will leave you wanting more. Or how about a Peach Rocket Salad: Arugula, local bleu cheese, pistachios and peaches, mixed together and topped with an apple cider poppy seed vinaigrette. The Sunburst Trout features a generous piece of fish with a basil almond crust, served with green beans and Three Graces Flamenco Cheese Smashed Potatoes. The social calendar within the Champion Hills community consists of over 50 different activity groups, ranging from various skilled card games to fitness groups to brewery visits. Don’t want to travel outside the gates to a brewery, no problem. Champion Hills offers seminars on how to craft your own brew. No matter which group you choose, you’re sure to have some fun, meet new people and make new friends. If your hobbies include hiking, traveling, yoga or piloting, or you simply enjoy a good cigar, chances are that others at Champion Hills that share your interests. Click Here for a more complete list of activities within the community. The membership at Champion Hills is very philanthropic and is deeply committed to giving back to the local Hendersonville community through volunteer efforts. Many members are involved with such organizations as the American Red Cross, the Community Foundation of Henderson County and the Boys & Girls Club of Henderson County. There are many people within the community of Champion Hills that share in the vision of an improved local community. Champion Hills offers several types of memberships. Golf Members and their children, grandchildren, parents and grandparents can enjoy year-round, unlimited access to Champion Hills’ highly-rated Tom Fazio golf course, as well as all other club amenities. Social Members and this same vertical family line enjoy all aspects of the clubhouse, fitness center, tennis courts and more. You don’t need to live in Champion Hills or own property in the area to be a member. If you simply visit the area periodically for business or pleasure, then their National Membership could be a good fit. National members enjoy many of the same benefits as golf members, just not year-round. For more information about the membership options available at Champion Hills, please email the director of membership & activities, Heather Myers, at heatherm@championhills.com or give her a call at 828.696.1962. 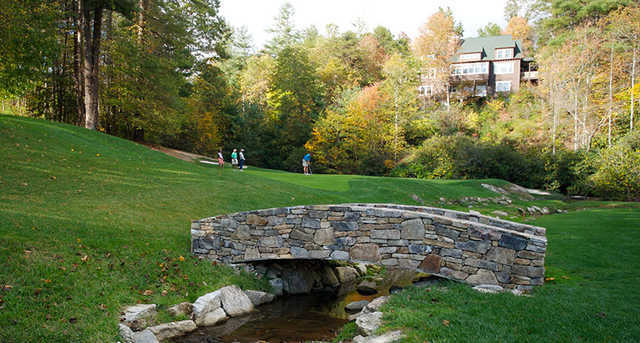 Whether you’re looking to relocate to the mountains of Western North Carolina and make it your permanent residence or you’re looking for a seasonal mountain retreat, you’ll find that Champion Hills is the perfect mountain golf community.